Monitoring macaque health requires the detection of infectious diseases. Here, we report the screening of a macaque colony for antibodies which indicate selected viral infections. Our results show that infection with beta- and gamma-herpesviruses was frequent, while infection with simian retrovirus type D and simian T cell leukemia virus was not. Measles virus infection was more frequent in animals with extensive contact with humans, but no firm correlation could be established. 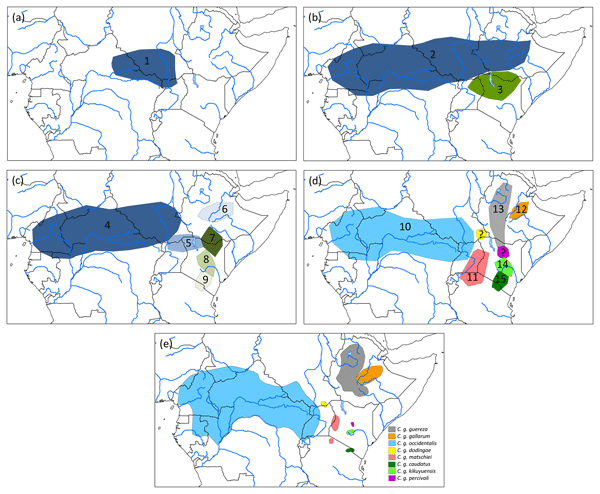 Is Colobus guereza gallarum a valid endemic Ethiopian taxon? Ethiopia is well-known for its high biodiversity and endemism. Among these endemics are two putative subspecies of the guereza: Colobus guereza guereza and C. g. gallarum. Our molecular study supports the two-subspecies hypothesis, making C. g. gallarum an Ethiopian endemic taxon. In combination with its very restricted range, C. g. gallarum is most likely one of the most endangered subspecies of black-and-white colobus.